This retrofit project in south Dublin proved complex, but despite the challenges it ultimately appears to have met the onerous Enerphit standard for low energy retrofit. The client, who wishes to remain private, had been living in Rathgar, Dublin with his family. With two young children the family wanted more space, but were eager to remain locally. Because the area has been well developed for over a century, buying an old house and renovating was the obvious way forward. The client spent a few years looking for a suitable property, before buying a 300 square metre early 20th century detached house. Unlike other homes on the street, it was not a protected structure. This made it possible to externally insulate the pebbledash building, thus driving U-values as low as possible and eliminating thermal bridging. But the client was also eager that the retrofit remain sympathetic to the local architectural style. Ralph Bingham of Mola Architecture produced the drawings for the planning permission (and later took on the role of project architect during the build). Another architect and passive house designer, Natalie Walsh, was also appointed and produced the working construction drawings, including 16 details related to cold bridging and airtightness. 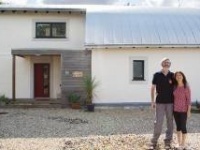 She also found passive house building firm Pat Doran Construction Ltd — run by father and son team Pat and Paul Doran — through Passive House Plus magazine. The client had originally looked at the possibility of meeting the Enerphit standard for retrofit, but thought it would be too expensive, though they still planned to adopt passive house design principles. But when Pat Doran Construction was appointed, they pushed the passive house agenda. “We said it might be possible to do Enerphit without it costing more,” says Paul Doran. Paul Doran says that while many builders don’t like working in Dublin because of the traffic and lack of space, this house made for a nice change, with its spacious site providing ample room for a site office and small canteen. “It was a brilliant location,” he says. Being a big, old building with lots of different junctions, meeting the Enerphit standards for airtightness and thermal bridging was always going to be the biggest challenge. “There were numerous junction details, and all of them were potentially problems in getting the envelope cold bridge free. On top of that you had all of the services,” Paul says. The house features a wide array of services including automated LED lighting, a security system and audiovisual systems — all of which can be controlled remotely by smartphone app. All mechanical and electrical services including the heating and cooling setup were designed by Ethos Engineering. Ethos spoke to some of their clients who had built near passive buildings, and they reported overheating to be the biggest issue1 — particularly the length of time it took to cool their dwellings down after returning from time away in summer. 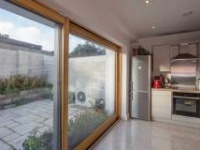 The client points out that while PHPP, the passive house design software, allows homes to go above the overheating threshold of 25C ten per cent of the time, this still equates to about one month a year of overheating. Thus he was keen to have an active cooling system in the house. An outdoor Panasonic air source heat pump provides cooling via a refrigerant delivered to fan coil units in each bedroom (completely separate to the ventilation system). There is a thermostat in each of the bedrooms to control this system, which can also provide heating if necessary. Separately, a high efficiency condensing gas boiler provides heat to Polytherm underfloor heating pipes downstairs and towel rails upstairs. There’s also a solar thermal system to help meet the family’s hot water demand. The gas heating and hot water is all regulated by Heat Miser controls, with a touchscreen in the plant room, and can be controlled by smartphone too. And given the size of the house, there are two Zehnder ComfoAir MVHR systems providing fresh, pre-heated air through the house. “We spent a week figuring out how to get the ventilation system inside the airtight envelope,” Paul Doran says. “We did manage it in the end.” The semi-rigid ducting used for the manifold, he adds, would have been a nightmare to seal with tapes and membranes otherwise. The builders took a number of key steps to make sure the airtight layer remained intact: this included direct site supervision from Paul’s father Pat, giving ‘toolbox talks’ to tradespeople on site, and putting up signs warning people on site to inform the builders if the airtight layer was breached, whether intentionally or by accident. “The worst thing someone could do was drill a hole and not tell us about it,” Paul says. The team removed the chimney stacks completely, cutting out a major cold bridge and source of air infiltration in one swoop. Meanwhile Compac Foam mats supplied by Galway-based company Partel cut out thermal bridging between the seven structural steel beams and the foundations. While the house is essentially a retrofit, with external EPS insulation to the original brick walls, large sections were rebuilt with concrete blockwork and insulated in the same manner. The footprint of the original building was also extended by about 100 square metres with a single-storey side and rear extension. The roof was also a mixture of new and original parts, all insulated heavily with Isover Metac glasswool. The old suspended timber floor was removed, and a new concrete poured and insulated with PIR board and finished with polished concrete. There’s also thermally broken triple-glazing throughout – in the form of windows and doors from Rationel Vinduer Ltd, Reynaers curtain walling, and Fakro roof windows. The dedication to a highly airtight, continuous thermal envelope posed a threat to the family dogs – as a dog door would have created a significant thermal weak spot. The solution was an automated pet door from Austrian manufacturer Petwalk, which combines access for pets, burglar-proof security and a highly airtight, highly insulated, thermal bridge-free design. The project involved much more than energy efficiency work though. All internal walls were knocked, and the team completely reconfigured the layout inside, turning the ground floor into a much more open plan, light-filled space. “We were looking for something that flows well, something that was open plan, that suited our way of living,” says the client. “There’s a nice fresh feel in the house,” he says. The natural lighting strategy has worked well, with the coloured LEDs — designed to change the mood of the living space — only coming on late in the evening. The project was awaiting Enerphit certification at the time of going to press. 1– ed. This appears to be a problem for new homes in general, rather than for passive houses per se. 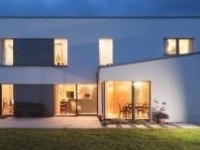 While passive houses are designed to meet maximum average temperature targets, there are no such requirements in Irish or UK building regulations – meaning many highly insulated new homes are being built without regard to whether orientation, form, layout and/or lack of shading will run the risk of causing unacceptably high or low internal temperatures. Similarly, it’s possible to use site-specific weather data for passive houses, while the software tools used for Part L compliance for dwellings in Ireland and the UK respectively use data from Dublin Airport and UK average weather data, leading to additional risk of overheating, underheating or higher than anticipated energy use. Extension boundary wall (adjacent to neighbouring house): 215mm block on flat internally followed outside by 80mm Xtratherm insulation, 20mm ventilated void, and then 100mm block externally. Before: Roof slates to sloped areas and torch on felt to flat roof areas externally. No Insulation. Sliding doors & curtain walling: CareyGlass 52mm triple-glazing with A-rated warm edged spacer bars. Ug value: 0.7 W/m2K. Reynaers frames for sliding door & curtain walling with respective U-values of 2.6 & 2.3 W/m2K. 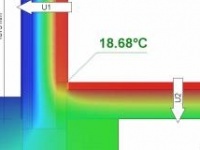 Overall U-values for sliding doors & curtain walling respectively of 1.1 & 0.90 W/m2K. After: Remeha modulating condensing gas boiler, 40 Kingspan solar tubes, underfloor heating to ground floor, and six fan coil units providing cooling to upper floors supplied by a Panasonic heating & refrigeration air source heat pump. Polytherm underfloor heating system with Heat Miser controls. Heat Miser control system regulates underfloor heating system downstairs and towel rail circuit upstairs, with a thermostat in every room, while also controlling the hot water. Also controllable via a touchscreen interface in the plant room. Before: no ventilation system. Reliant on infiltration, chimney and opening of windows for air changes. 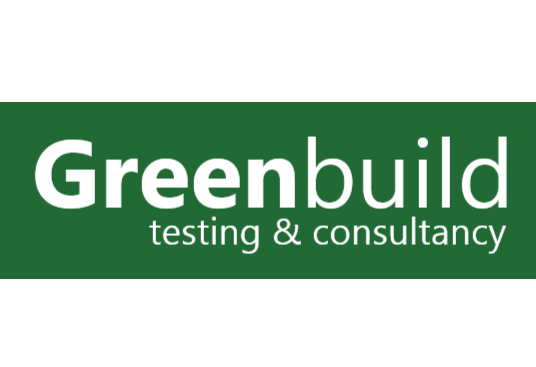 Leading low energy and passive house builders. 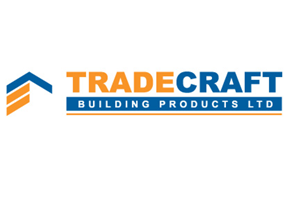 Formed in 1999, Tradecraft is a leader in the delivery of quality, tailored construction solutions for the Irish building industry.